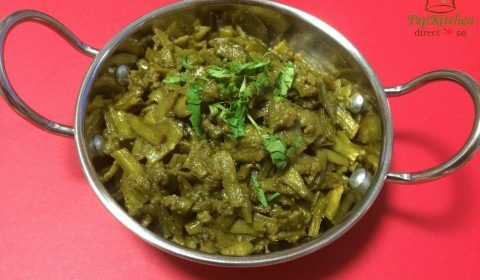 Guar Nu Shaak/Cluster Beans Fry/Gavar ki sabji is a dish served in Gujarati household for lunch along with roti, rice, dal or kadhi and salad. 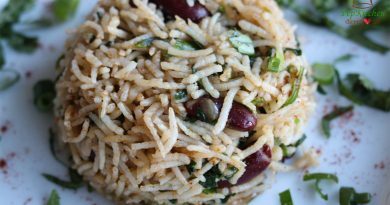 It is a simple, quick and easy dish made regularly at our home. My son loves Guar. It is one of his favorite vegetables. He will happily eat it by sprinkling some sugar on the top with hot roti and dal. 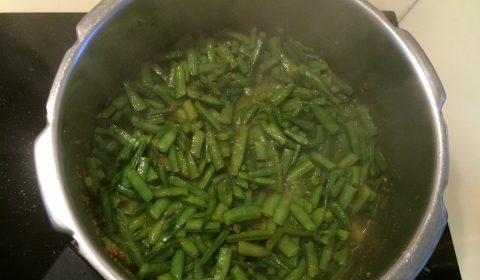 Guar is known as cluster beans in English and is a flat bean. It is slightly bitter in taste but has a very unique flavor. I prefer cooking with ajwain (carom seeds) and ginger and garlic. Back in India, I used the fresh Guar (cluster beans). 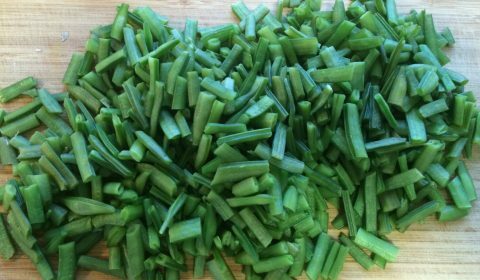 I preferred using the tender and green guar to the thick and yellowish ones. 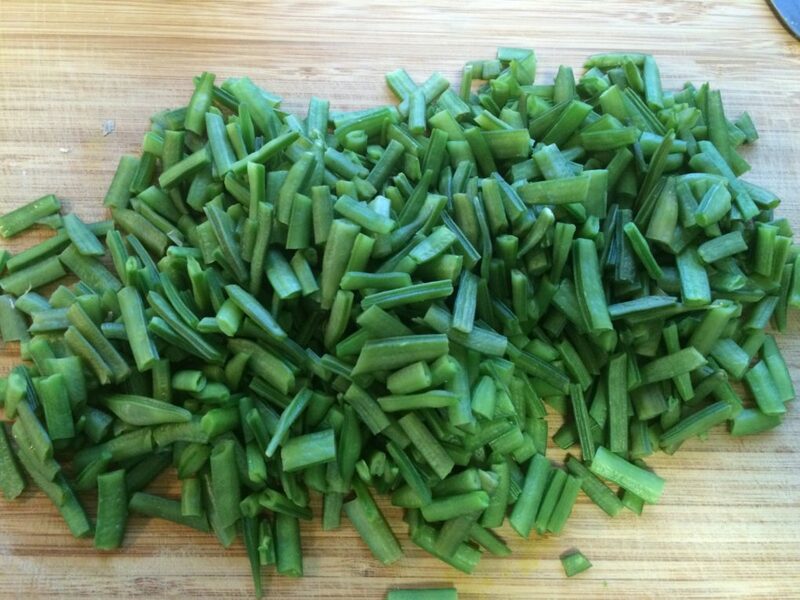 Wash the guar properly under tap water and then with hands or knife remove both the ends of the beans. Then chop them lengthwise. However here in Sydney, we get the guar into frozen packets in Indian grocery stores. I thaw them before cooking and use. I prefer cooking the Guar Nu shaak into a pressure cooker. Many people prefer cooking it in an open pan. 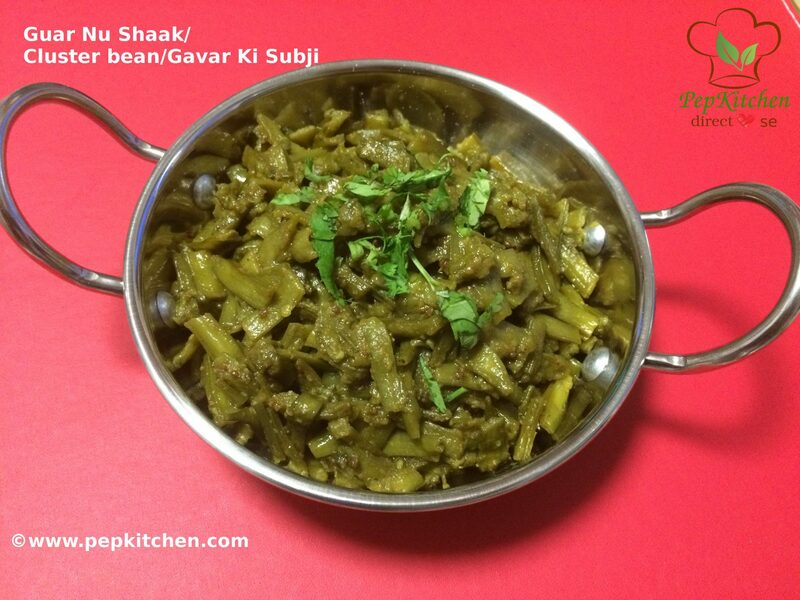 I have shared the pressure cooker method of making guar nu shaak. Heat oil in a pressure cooker pan. Add ajwain, ginger garlic paste, asafoetida. Lower the heat and then add the spices- turmeric powder, coriander-cumin seed powder, red chili powder, and sugar. Saute till spices are fragrant. Add the washed and chopped guar. Add very little water and pressure cook for 4-5 whistles on high heat and 2 whistles on low heat. Let the pressure cooker cool by itself. Open the lid, mix gently the shaak and remove in the serving bowl. 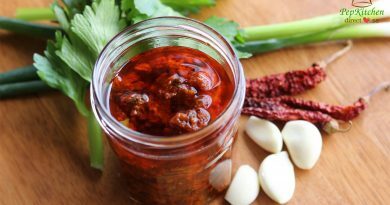 Garnish with coriander leaves and serve hot with roti or bhakri. Some people prefer adding crushed peanuts, sesame seeds and coconut for additional flavor. You can also add chopped potatoes or tomatoes to the shaak while cooking. 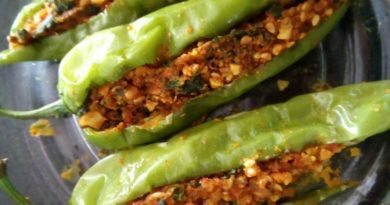 It is vegan and you can avoid adding asafoetida to make it gluten-free. If you want rasa or curry in the guar nu shaak, add more water while cooking it. The method of making guar nu shaak varies in different parts of India. It is healthy and delicious. So friends cook this simple, quick, easy and delicious guar nu shaak and do share your views and comments. 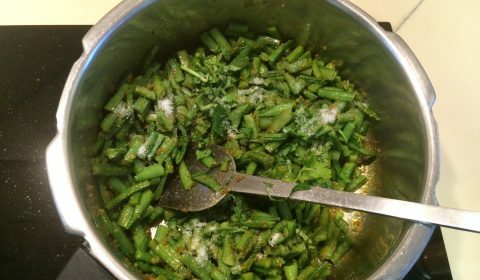 A very easy and everyday vegetable dish made from cluster beans (Guar/Gavar) flavored with carom seeds, ginger garlic, and spices. It is vegan. Skip adding asafoetida to make it gluten free. 2 tbsp coriander washed and chopped. Keep some aside for garnishing. Wash and chop the cluster beans lengthwise 1/2 inch long. Heat a pressure cooker pan, add oil, add carom seeds (crush carom seeds between palms to give more flavor). 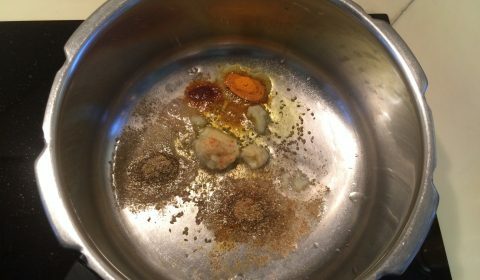 When it crackles add asafoetida, turmeric powder, and ginger garlic paste. Saute on low heat for a minute and then add sugar, red chili powder, coriander-cumin powder. Mix saute for half a minute. Add the chopped cluster beans/ guar/ gavar. Mix well. Add salt, coriander leaves and 1/4 cup of water. Cover the pressure pan with the lid with a ring on and put whistle. Cook for 4-5 whistles on high heat and 2 whistles on low heat. Let the cooker cool down by itself. Open the lid. Mix the shaak well. It is ready to serve. Remove the guar nu shaak in the serving bowl. Garnish with coriander leaves and serve hot with fulka roti, dal, rice and salad for an everyday complete meal. Thank you for sharing nice and easy recipe.